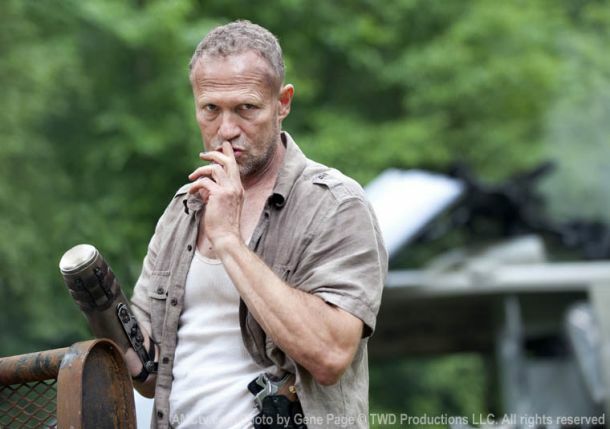 Look at What Merle Dixon Looks Like in the Upcoming Season of ‘Walking Dead’!!! When did we last see Merle Dixon (Michael Rooker)? I believe it was when Rick left Merle handcuffed to a pipe on the roof of that building in the first season. When zombies broke into the building and made their way up to the roof, Merle had no choice but to chop his hand off so that he could survive. And we also saw that he cauterized his wound with an iron on one of the lower floors of that building. Well, it looks like he’s back and pissed off. ‘Walking Dead’ season 3 starts this October on AMC. This entry was posted on Thursday, June 14th, 2012 at 1:51 pm	and is filed under News, Television. You can follow any responses to this entry through the RSS 2.0 feed. You can skip to the end and leave a response. Pinging is currently not allowed. « Al Pacino Headed to Broadway for ‘Glengarry Glen Ross’!! !